AINKAWA, Iraq (CNS) — The last thing Abu Sabah ever pictured in his life was being homeless and living in a tent in a park somewhere. 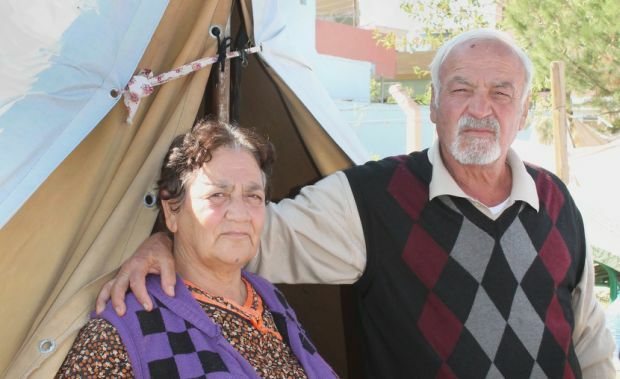 But that is exactly what he and his family are experiencing in this Christian enclave outside of Irbil, the capital of the Kurdistan area of northern Iraq. Sabah, a Syriac Catholic from the predominately Christian town of Qaraqosh, a 45-minute drive away, had a good job, a big house, a car and was surrounded by a strong family community until Islamic State militants swept through the town Aug. 6, turning their world upside down. “Islamic State forced us out and that’s why we’re here,” Sabah explained, pointing to the haphazard array of canvas tents strung along the now ragged park grounds. Sabah tries to keep a positive attitude about his family’s situation. Family members are pinning their hopes on a son’s chance to travel to Jordan as the first stop on the way out of Iraq and onward to the West — and the start of a new life. The son, Saleh, is joining a growing number of Christians who continue to leave Iraq, saying that as long as Islamic State militants are around, they do not feel safe remaining in their homeland. By early November, about 4,000 Iraqi Christians had fled to Jordan, according to Caritas Jordan, the church’s humanitarian organization. Other Iraqi Christians traveled to Lebanon and Turkey, Catholic officials in northern Iraq said. Saleh Sabah said a Catholic priest arranged for his family of four to travel to Jordan under the auspices of the Catholic Church, which along with the country’s ruler, King Abdullah II, has facilitated the Christians’ safe passage. “I don’t have money. Life is really difficult as it’s impossible to work after we had to flee our homes,” the carpenter explained. The elder Sabah, his wife, Um, and other family members expect to be camping in the park for the foreseeable future. “Churches are providing us with food and there is a medicine dispensary nearby. Others are bringing clothing,” he said while neighbors distributed trays of rice and beans in makeshift tent community. Sabah said, however, that he and his family were determined to tough it out even with the approach of winter. “Rain did come inside our tent some days ago, but I say welcome to the water. I can swim in it,” he said, laughing. “We’ll see if someone will exchange these flimsy tents for trailers. But even if there is snow, it won’t be a problem for me,” he said. Yet, time weighs heavily for the displaced families, and Sabah is eager to chat with anyone who passes by his tiny patch. Sabah and his wife lack a passport, preventing them from applying to travel with their son. “If the Americans could send me a spaceship, I would fly to the moon,” he joked. Other members of Iraq’s minority communities who have been displaced by Islamic State attacks suffer the same fate. Without a passport, it is impossible to travel elsewhere. The trip to Iraq’s capital, Baghdad, to obtain travel documents is too dangerous to risk. The Syriac Catholic parish in Irbil is trying to help the displaced apply for passports and needed documents. “Most important for me is that we return to our home in Qaraqosh. Believe me, I would return in a flash if Islamic State weren’t there. However, I have now heard that nearby villagers have taken over my house and property,” Sabah said. He said if he could leave he would travel to be with his daughter, who has lived in California for several years. Father Rifat Bader runs a Roman Catholic parish in suburban Amman, the Jordanian capital, where about 50 Iraqi refugees have taken shelter since September. Like the others, they came with few possessions. “They are knocking on the doors of the embassies,” hoping for settlement, but embassies are making them wait six months for a second appointment, he said. The priest and other church officials are concerned about the diminishing presence of Christians in conflict-ridden countries in the Middle East, particularly Iraq and Syria. The church wants to continue to build up their Christian faith and encourage people to maintain a steadfast witness in their ancient homeland, but recognizes that asking people to remain when their lives are in danger is impractical. “What is in their minds now is to have a visa and to travel to other countries. But we also have to encourage them to adapt such speech and mentality to ‘I want to go home. I want to go back to my homeland,'” Father Bader said. For now, many Iraqi Christians are not thinking of returning home or looking back. Saleh Sabah had to be pinched while he waited in the Irbil airport to board his flight to Amman. He could hardly believe that he was actually leaving Iraq behind and all of its troubles. “This is the most amazing thing. God is generous to us,” he said.